Swimmers take off during the 2017 Wharf to Waves ocean swim. Photo: Wharf to waves Facebook page. Although people within a few hours of the far south coast have often travelled to attend the Tathra Wharf to Waves fundraiser since its inception 18 years ago, this year Tathra local Mary Burke [formerly Mary Davis] will fly in from her new home in New Zealand to participate in the annual ocean swim. It seems that those who take part in Wharf to Waves once are compelled to return. Carly Rixon, 24, of Canberra has participated in Wharf to Waves swimming events four years in a row and says she can’t put it into words how good the event is. 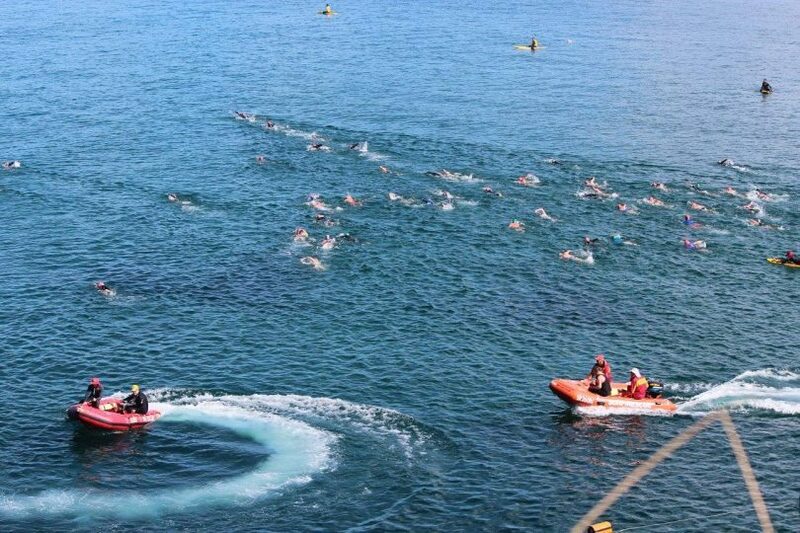 The event, which has a fun run and cycling leg as well as the ocean swim, will be held on January 19 and 20 this year. 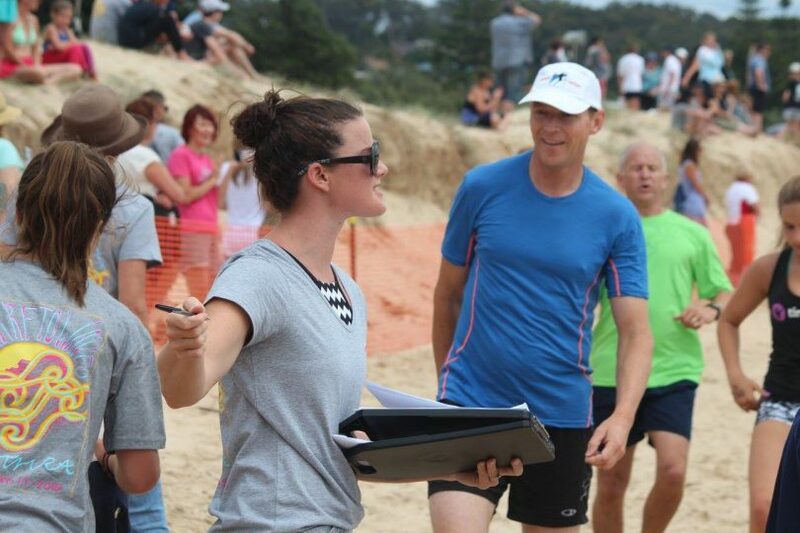 Board secretary Kylie Dummer expects it will attract about 400 participants and raise $30,000 for local organisations – Tathra Surf club, Tathra Preschool, Tathra Primary School and Tathra Rural Fires Service. “That’s a lot of money for a small town,” Dummer says, adding that last year Tathra preschool was able to complete an extension and renovation of their kitchen using Wharf to Waves funding. Tathra Wharf to Waves is run solely by volunteers – it takes over one hundred volunteers to make the event happen, says Dummer – people who do everything from setting up the courses for all events, cooking the barbeques and cleaning up after the event while Tathra Surf Lifesaving Club members provide safety and first aid for swimmers. Over a hundred volunteers are needed to make the annual Wharf to Waves the spectacle it is. Photo: Wharf to Waves Facebook page. The Wharf to Waves event is “an annual highlight,” Burke says. While Burke says she has won her age category in past years [2014, 2015, 2016 and 2017] “because I had very limited competition,” she expects that this year her friend Ann Herbert, who recently turned 70, will take first place. Limited competition is an understatement. In 2017, Burke won first, second and third prize in the over seventy age category because she was the only participant and her friend Judy Rettke photoshopped a picture of her on the dais in every position. Lady Mary Burke in 2017, the year she won first, second and third place in the Tathra Wharf to Waves ocean swim as the only entrant in the over 70 women’s age category. Photo: Tony Rettke, photoshopped by Judy Rettke. This year marks Burke’s tenth swim and she says she will be admitted as a member of the Squidgy Club. 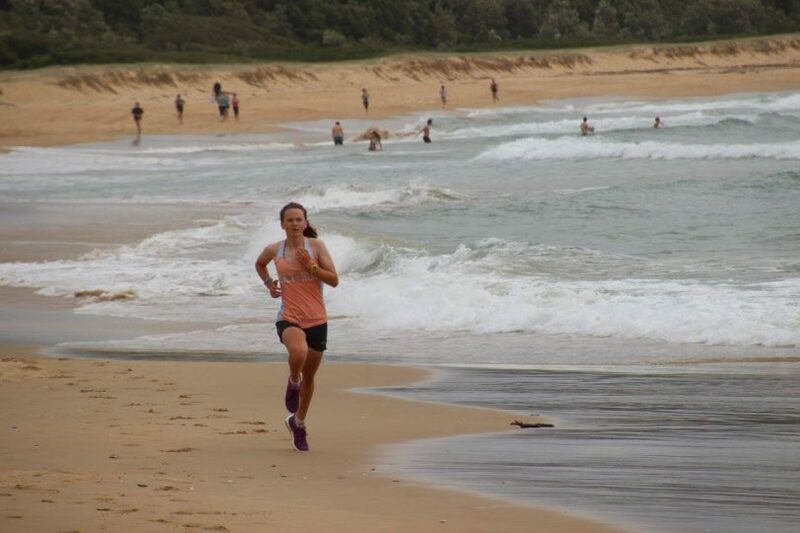 Until January 19 rolls around, Burke is looking forward to running along Tathra beach after the swim to greet her two daughters and her grandchildren. “Many children attend the funeral of their grandmother but mine have just been to my wedding and now they will cheer me on in the swim. They think that is pretty cool!” says Burke. But something will be different this year – since her 2018 marriage, Burke has a new title. “I can’t wait to hear Tony Rettke announce the arrival at the finish of ‘Lady Mary Burke,’” she says cheekily.